CLICK here to access the Annual Drinking Water Report (CCR) for 2017. Water bills are mailed on the 1st of each month. The due date is the 15th of the month. Any bill unpaid after the 15th receives a 10% late fee. An account is considered delinquent if not paid by the due date. A second notice will be sent around the 23rd of the month and payment will be due 7 days later. If the account is unpaid by the due date stated on the second notice, water service will be terminated. A $50 turn-on fee is charged to reinstate the service. If the charges for the water bill are not paid due to a check returned by the bank for non-payment for any reason, a notice of the returned check will be sent informing the account holder of the dishonored check and a $25 returned check charge will be added to the account. If the bill remains unpaid due to the returned check, water service to the property will be terminated on the date stated in the notice. If the charges for a delinquent account are not paid due to a check returned by the bank for non-payment for any reason, water service will be terminated immediately without a notice being sent. If water service is terminated for non-payment for any reason, the $50 turn-on fee will apply. IF WATER SERVICE IS TERMINATED AS A RESULT OF DELINQUENCY OR NOTICE OF INSUFFICIENT FUNDS, payment must be received by 3 p.m. in order for service to be reinstated on the same day. For all billing questions concerning water, please call Roanoke Village Hall at 309-923-3661. Village Hall is open Mon. – Fri. 8:00 AM – 3:00 PM. Put your payment in drop box located at the end of Village Hall parking lot at 101 N. Main Street. Please Note: Drop box is checked ONCE per day after the mail is delivered in the morning. Please note: Paying in Person is required if paying to reinstate service shut-off for delinquency or insufficient funds to guarantee water service is reinstated the same day the payment is made. If payment for reinstatement of service is placed in the drop box, please be sure to include all fees stated in the letter that apply. Payments can be automatically deducted from your bank account. Authorization form can be obtained from Village Hall or from the Village Website at www.roanokeil.org. Garbage is picked up on Tuesday of each week. Garbage must be at the curb by 5:00 AM with a limit of four (4) thirty-gallon bags or containers. NO grass clippings or garden waste can be put into garbage for pick-up. PLEASE NOTE: Holidays that fall on Monday or Tuesday will result in a Wednesday pick-up. Recycling is available at the recycling container near the Roanoke water tower. There is one bin in the container for newspaper only. 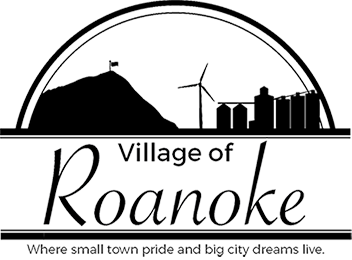 Each Spring, the Village of Roanoke holds Clean-Up Week. The dates for 2019 are April 15th - 19th. The purpose of clean-up day is to provide a pick-up for small household items to be disposed of that cannot be set out for garbage pick-up. The Village does accept batteries. 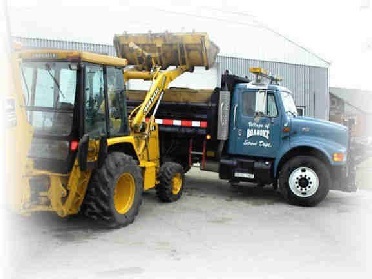 This service is not intended for disposal of large construction/demolition projects, clearing the contents of a residence, paint, tires, or hazardous chemicals. Please do NOT put items out until the Friday prior to clean-up day. The date is published in the Roanoke Review and posted at the Post Office, IGA, and the local banks. All items must be placed at the curb no later than 7:00 AM on Monday. The Village Street Department Employees will make one pass through town. Once they have gone past your house, they will not come back and pick-up additional items. You may add items until they have picked up your area. The purpose of tree limb pick-up is for storm clean-up and tree trimming only. Removal of trees (and any part thereof) is not included. Also, this service does not include garden waste. The Village provides this service on the third Wednesday (must be to the curb by 7:00 AM) of the month from March through October. Leaf pick-up begins in Mid-October. Leaves must be to the curb (NOT into the street) by 7:00 AM. Christmas tree pick-up will take place on January 9, 2020.